A server is a computer designed to process requests and deliver data to another computer over the internet or a local network. The word 'server' is understood by most to mean a web server where web pages can be accessed over the internet through a client like a web browser. However, there are several types of servers, including local ones like file servers that store data within an intranet network. Although any computer running the necessary software can function as a server, the most typical use of the word references the enormous, high-powered machines that function as the pumps pushing and pulling data from the internet. Most computer networks support one or more servers that handle specialized tasks. 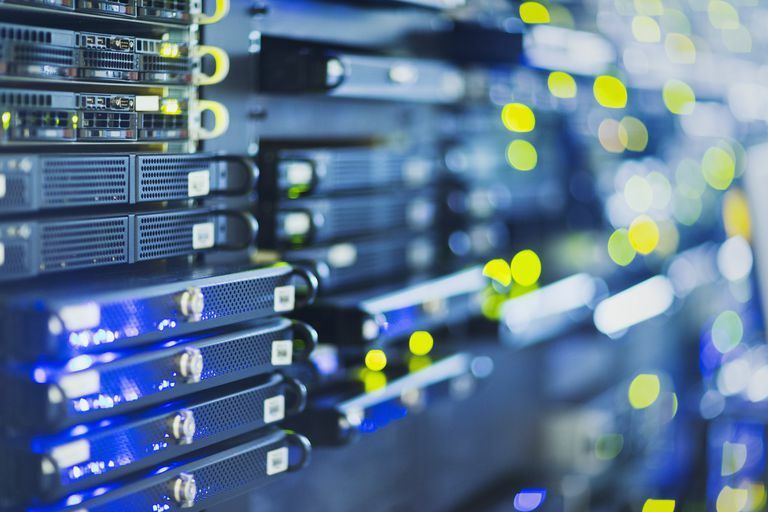 As a rule, the larger the network in terms of clients that connect to it or the amount of data that it moves, the more likely it is that several servers play a role, each dedicated to a specific purpose. Strictly speaking, the server is the software that handles a specific task. However, the powerful hardware that supports this software is also usually called a server because server software coordinating a network of hundreds or thousands of clients requires hardware much more robust than what you'd buy for ordinary consumer use. While some dedicated servers focus on one function only, some implementations use one server for multiple purposes. Web server: Web servers show pages and run apps through web browsers. The server your browser is connected to right now is a web server that's delivering this page and any images you see on it. The client program, in this case, is most likely a browser like Internet Explorer, Chrome, Firefox, Opera, or Safari. Web servers are used for all sorts of things in addition to delivering simple text and images, such as for uploading and backing up files online through a cloud storage service or online backup service. Email server: Email servers facilitate the sending and receiving of email messages. If you have an email client on your computer, the software is connecting to an IMAP or POP email server to download your messages to your computer, and an SMTP server to send messages back through the email server. FTP server: FTP servers support the moving of files through File Transfer Protocol tools. FTP servers are accessible remotely via FTP client programs. Identity Server: Identity servers support logins and security roles for authorized users. Hundreds of different types of specialized server types support computer networks. Apart from the common corporate types, home users often interface with online game servers, chat servers, and audio and video streaming servers, among others. Many networks on the internet employ a client-server networking model that integrates websites and communication services. An alternative model, called peer-to-peer networking, allows all the devices on a network to function as either a server or client on an as-needed basis. Peer networks offer a greater degree of privacy because communication between computers is narrowly targeted, but most implementations of peer-to-peer networking aren't robust enough to support large traffic spikes. The word cluster is used broadly in computer networking to refer to an implementation of shared computing resources. Typically, a cluster integrates the resources of two or more computing devices that could otherwise function separately for some common purpose (often a workstation or server device). A web server farm is a collection of networked web servers, each with access to content on the same site. They function as a cluster conceptually. However, purists debate the technical classification of a server farm as a cluster, depending on the details of the hardware and software configuration. Because servers are just software, people can run servers at home, accessible only to devices attached to their home network. For example, some network-aware hard drives use the Network Attached Storage server protocol to allow different PCs on the home network to access a shared set of files. Plex media server software helps users consume digital media on TVs and entertainment devices regardless of whether the media files are on the cloud or a local PC. Since uptime is critically important for most servers, they never shut down but instead run 24/7. However, servers sometimes go down intentionally for scheduled maintenance, which is why some websites and services notify their users of scheduled downtime or scheduled maintenance. Servers might also go down unintentionally during something like a DDoS attack. What Is a Computer Network Device and How Does it Work?